Transporting and dispensing flammable liquids are high risk activities. Flammable liquids release vapors. Mixing these vapors with oxygen creates a potential fire risk. Safety cans meet Occupational Safety and Health Administration (OSHA) criteria and keep flammable liquids safe in volumes up to 5 gallons (19 liters). Always use a red safety can with a yellow band to transfer flammable liquids with a flash point below 80 F (27 C). OSHA also allows the stenciling of the exact contents onto the side of the safety can. All Justrite safety cans carry a yellow band with a large area on the band for the user to identify the contents. Vapors must not escape from the safety can and into the atmosphere. This prevents the formation of an explosive mixture with the air. Safety cans feature spring-loaded and self-closing caps to keep vapors inside the container. However, under conditions of high pressure in the safety can, the cap must open to relieve the pressure. A fire in the building will cause the temperature of the can's contents to increase. Pressure in the safety can also builds, creating a risk of explosion. The spring-loaded cap is a key safety feature to relieve pressure and avoid an explosion. Regularly check flame arresters for damage or holes. Replace damaged flame arrestor screens immediately. Any hole in the screen will affect the performance and may allow a spark to penetrate the vapor space inside the container. Extra safety features on Justrite metal safety cans make them more resistant to damage and easier to use. Re-enforcing rings on the body of the safety can strengthen the walls and reduce the risk of denting. Double lock seams at the base of the safety can provide extra thickness and protect against bumps and dents. A half-inch (13 mm) grip lip along the bottom of the safety can assists with pouring. It also protects the bottom surface from damage when placed on uneven surfaces. Composed from high-grade coated steel, the cans feature a tough powder-coat finish that resists chemicals. Because the color is molded into the can material instead of painted on, Justrite non-metallic safety cans maintain their good appearance longer than metal ones. This makes them suitable for high impact and dirty sites like construction and manufacturing facilities. Their excellent resistance to chemical attack makes them appropriate for laboratory settings. Non-metallic safety cans also meet OSHA standards. Their dense, thick polyethylene composition provides high resistance to dents and bumps. They are more drop resistant than metallic safety cans. Justrite non-metallic safety cans also feature a unique current carrying carbon insert to enable grounding and bonding. Bonding and grounding prevents the buildup of static electricity. Static electricity is the formation of electrical charge which carries the risk of creating a spark. Attach anti-static wires with clips at each end to the safety can, the receiving container and a grounding point. These connections will ensure that any charge buildup dissipates to ground before generating a spark. 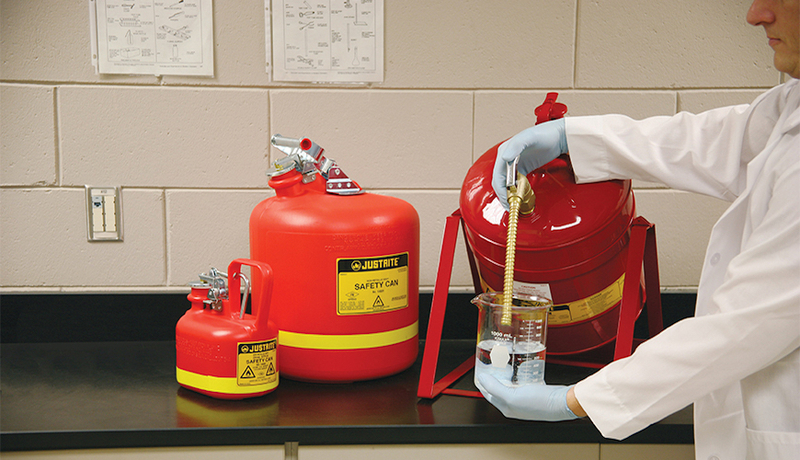 Justrite supplies safety cans for the safe dispensing and transport of flammable liquids.